Generation We - the Millennials - has arrived. They have emerged as a powerful political and social force. Their huge numbers and progressive attitudes are already changing America. And the world. "In my travels around the world, I have been very impressed by today's young people. They are smart, caring, creative, and generous. I share the hope expressed by Greenberg and Weber that this new generation will help re-orient our planet and conquer the problems of poverty, war, and pollution that currently plague it." "Energy, health care, national security, the environment—these are just some of the issues where Americans are hungry for solutions rather than slogans and posturing. I see hope in the fact that, as Greenberg and Weber detail in this important book, America's next generation will be prepared to help lead the search for real answers." "In a political world poisoned by cynicism and spin, the idealism, optimism, commitment, and energy of the Millennial generation offer an inspiring antidote. With their independent thinking and their readiness to abandon the partisan wars we've been fighting for too long, today's young people are poised to lead a worldwide revolution. 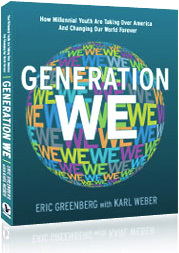 Generation We captures this transformational moment with insight and clarity." Along with a video campaign and a new social network-based movement creation site, Gen We will leverage the web and social networking to give the power back to the people, as it arms us with the digital tools we need to start our own campaigns and movements. WE know you will see the value of joining us. This web site serves as a place to learn about the different movements and individuals that embody the spirit of the Gen We movement while providing us with the information WE need to be globally responsible citizens. So join the movement, hit your friends up with the video, follow us on Twitter, and become our friend on Facebook.